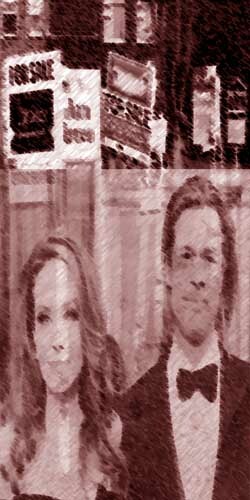 Bothered by the strange literary distractions of Brangelina. It’s getting to the point that I’m now severely regretting offering to help Brad Pitt and Angelina Jolie house-hunt in the UK. For some reason when I was first introduced to Brangelina at an Oscars ceremony by Peter Jackson, the oddly photogenic couple got it into their collective celeb hive mind of a brain that I work as a London-based estate agent. I think the misunderstanding arose when Peter told them I’d done some impressive alternative reality books, and they’d heard I was a high-end realtor with an impressive book of properties. ‘Brown. Big. Do you have brownstones in London?’ asked Brad. ‘Thanks, mate.’ The sly dog’s never really forgiven me for throwing up in his Gulfstream G350 on the way back from ComicCon that time. Most of the vomit comet went over Neil Gaiman, but enough of my Vesper Martini on full-reverse soiled George’s hand-monogrammed denelli seats that he still pulls %$£% like this on me. I’ll say one thing about the Big M. – that fella sure can carry a Nightfort-sized grudge. The Big M. had barely closed the video connection when a bright red Bentley Mulsanne with the personalised plates BPAJ pulled into my drive. ‘Kevin Spacey simply adores Hoxton,’ said Angelina. Angelina shot him an angry look. Maybe there was a touch too much truth in that joke. ‘Croydon,’ I insisted. ‘Croydon is where it’s at. It’s like Manhattan.’ Yeah, Manhattan when the Manhattoes lived there, scalping puritans. I had just come up with a great wheeze to get myself fired from this estate agent gig before my publisher at Gollancz canned my arse for non-delivery of a manuscript. I was going to give Brangelina the commando-tour of Greater London. By the time I’d finished with them, they’d think that a war zone in the Middle East was a Muswell Hill-sized buying opportunity. Ah. How little did I know. An Authorly Odd Life – the Terribly True Tales of Life in the Word Mines, may well continue with another entry seized from the diary of Stephen Hunt . . .
Well? Did they like Croydon? Local football team in Crystal Palace will give them things to do on a Saturday afternoon and may give them a feeling of a Royal patronage. Only time – and the next chapter – will tell, Andy! « Green energy to bankrupt the energy mega-corps? (and a writing update).